You need to regularly use our carpet cleaning services in London because every carpet will sooner or later become soiled and grimy-looking. It is your duty to invest time in cleaning if you wish to preserve the look of this important piece of the interior. However, it is easier said than done. Between dealing with various other chores and spending some time with your family and friends, you may find it near impossible to clean the carpet. At Best Cleaning Services London, we have the best solution for you – our carpet cleaning service. We can be booked to perform this task at your home whenever you require. Our company is readily available to come and assist you with specialised gear and well-trained personnel for this task. Throughout the years we have learned that vacuum cleaning is important, but it just doesn’t do the trick. Sure, it removes a large portion of the accumulated dust and dirt, but some particles remain and build up over time. Every carpet needs some extra cleaning and we are more than ready to provide it. Thanks to our steam cleaning, we can clean any type of carpet thoroughly. 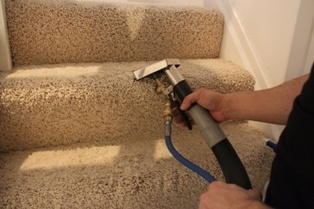 This method allows for full sanitation of the carpet. It involves injecting hot water into the carpet fibres and then sucking it out with specialised gear. The end result is always a carpet that looks like brand new. The method is completely safe and eco-friendly, which makes it great for every home. You don’t need to rely on expensive chemicals and dangerous ingredients, when you have Best Cleaning Services London ready and waiting for hire on 020 3322 1702. Our company is well-regarded as one with the most experience in the field. We have been around long enough to know how to address every single task to the highest standard. We can easily clean your carpet, regardless of its shape, size, colour and type. This is what makes Best Cleaning Services London such a great company to have around. We know that your time is valuable and for this reason, we try to keep our hiring procedure simple and straightforward. All you really need to do is contact 020 3322 1702 and state your request. Next thing you know, our carpet cleaners will be on the address, doing their best to restore your carpets. It goes without saying that we only aim to provide high-quality cleaning services to all our clients. You can bet that we will stop at nothing to get your carpets cleaned to the highest standard. That is the way we have worked in the past and we don’t plan on stopping now or in the future. Best Cleaning Services London can be yours to hire on 020 3322 1702. Acquire our carpet cleaning services in London and you will know you have made the best choice.